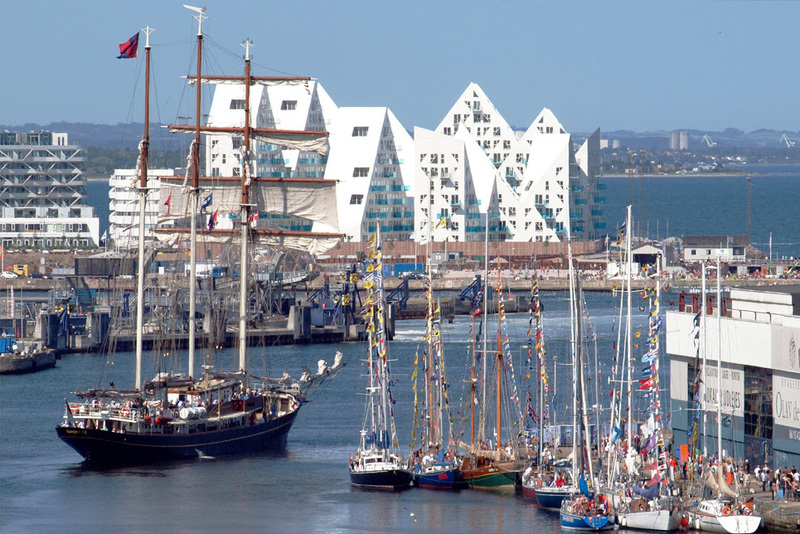 Aarhus International Sailing Center has obtained the absolute finest location in the city, that is at the tip of the newest district, Aarhus Ø. 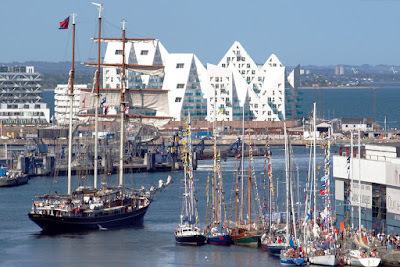 Situated at the promenade with a view of Aarhus Bay, Aarhus Ø is in the middle of Aarhus and is one of the recreational parts of the city with thousands of inhabitants. It is a spot that many would have sacrificed a limb to be able to claim. Now, instead, they can rejoice that the sailing center will strengthen the local area profoundly. Both as a striking construction and a tourist magnet. The building is both robust and flexible and can bear to ‘age with grace’. It represents a timelessness and possesses a strong architectural identity. The placement at the tip of the pier puts a perfect finish to Aarhus’ new, blue rambla. All the city’s water based unions are now placed in a long line and ends with Dokk1, which is the new cultural center of the city. The objective is to make it possible for sailors to sail all the way into the harbor by Dokk1 and to connect it with Brabrand lake, which is a very popular place for rowers. Collaboration and strong teamwork have created Aarhus International Sailing Center. Volunteers and enthusiasts are particularly important for the work on the sailing center, and as politicians we must offer our support when they present their ideas, enthusiasm and suggestions. The sailing clubs and Sailing Aarhus have collectively fought for the establishing of an international sailing center. We will not be taking anything from the local sailing clubs, neither from the local training milieu. The sailing center will only support the communities and it offers facilities of a high international standard. The elite and the public needs to go hand in hand like Yin and Yang. The sailing center need to support the good life on the water, both through sailing clubs and the local schools, which are already in collaboration with the municipal UNO open air center. The sailing center must give the young an opportunity to play by the sea, whether that means fishing for crabs or going sailing, so from the very beginning Aarhus International Sailing Center have had tremendous support. In 2018 the Aarhus International Sailing Center and Aarhus Ø be the venue for the Hempel Sailing World Championships 2018, which is the world championships for all the Olympic boat classes.